Gerrards Cross, UK, 18th February 2011: Arqiva has announced that it is providing co-located HD playout and distribution of Barclays Premier League football for leading international sports broadcaster ESPN. 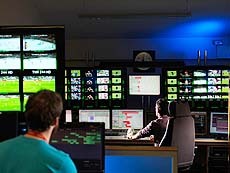 The solution employs a dedicated HD Playout Centre purpose built for ESPN at Arqiva’s Chalfont Grove Teleport. This is also responsible for the playout and distribution of eleven ESPN channels to countries throughout Europe, Africa and the Middle East. ESPN worked with Arqiva to design and direct construction of the Playout Centre, based on the sports media company’s specific needs – including High Definition and Dolby Surround Sound technology. It features four live playout suites, a multi-channel playout pod, production areas, a supervisory control area and an edit suite. Arqiva’s infrastructure and teleports provide international satellite and fibre connectivity, while a dedicated fibre IP circuit to ESPN’s HQ in the USA enables rapid sharing of content between locations by ESPN’s global teams.